The woodland around Look About Lodge are dotted with Jampanese barberry, an invasive plant. 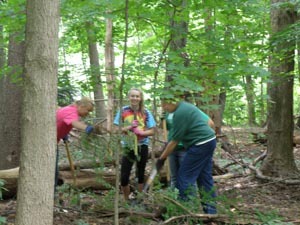 Ages 14 to adults ca bring work gloves and a shovel to help curtail the spread of theis shrub throughout the forest. Take 480 east to 422 (near 271). Quickly exit at Miles Road. Turn right (east) onto Miles. Look About Lodge will be on the right. Pick up a Native Plant card at one of our Programs. 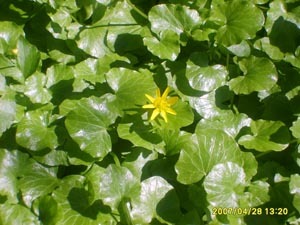 For more information about invasive plant species see the Ohio Invasive Plants Council website at http://www.oipc.info/. DO YOU KNOW ABOUT GIANT HOGWEED? Want to know more about the alien and noxious plant species, Giant Hogweed. Click here for a fact sheet distributed by Michigan. Giant Hogweed has been found in Ohio too. DO YOU KNOW ABOUT OUR NATIVE BUTTERFLY? 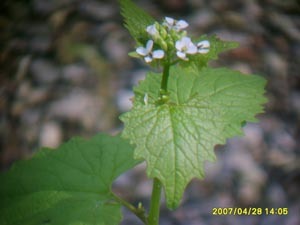 Did you know that the native West Virginia White butterfly die when it eggs are laid on Garlic Mustard. The West Virginia White looks like the familiar Cabbage Moth but the West Virginia White is found in the woods. For more information about this native butterfly click here. 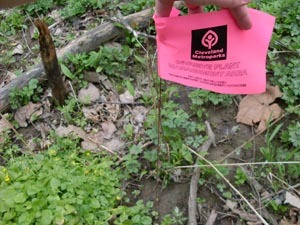 Contact Terri Martincic for any questions regarding Western Cuyahoga Audubon's Weeders-in-the-Wild at 440-759-8220 or email: naturenutATwowway.com. Looking to get involved in restoration work in the Fall of 2013? 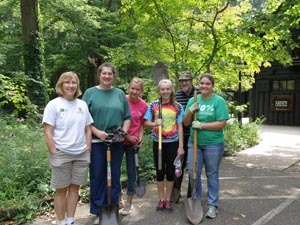 Check out the Watershed Volunteer Program at Cleveland Metroparks. 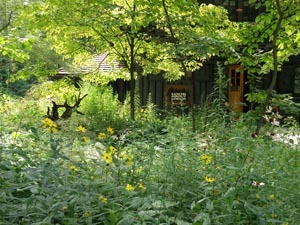 If your not a Cleveland Metroparks volunteer, you can sign a one day waiver. It's a great way to get involved and make our world a better place. Invasive Plant Recon Team Volunteers, 16 years and older, are needed to scope out and assess areas before and after plant management (herbicide application) to identify pockets of native versus non-nativeplants. Volunteers must have an interest in plant identification, physical ability to hike variable terrain and basic map, orienteering and/or GPS knowledge. 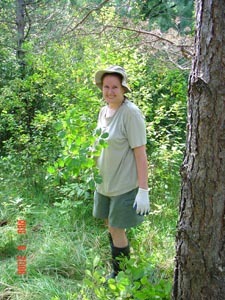 Volunteer activity will vary from season to season. Anyone interested in this activity must apply. For an application or additional information, contact Heather at 216-635-3258 or hat@clevelandmetroparks.com. 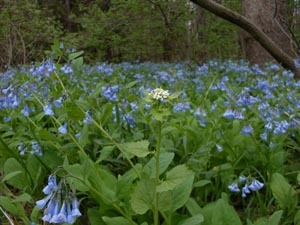 For weeding opportunities in the Cuyahoga Valley National Park Click Here.